All student groups from grades K-8 can all take advantage of the Yorktown Museum's wealth of history. Organize a group tour of the museum or expand on one topic and create a dynamic interactive learning experience for your students. Don't see something you would like to try, just ask the museum staff. We will help you find whatever you might need in our research room! The traveling trunk is a sampling of history to arouse ones interest. 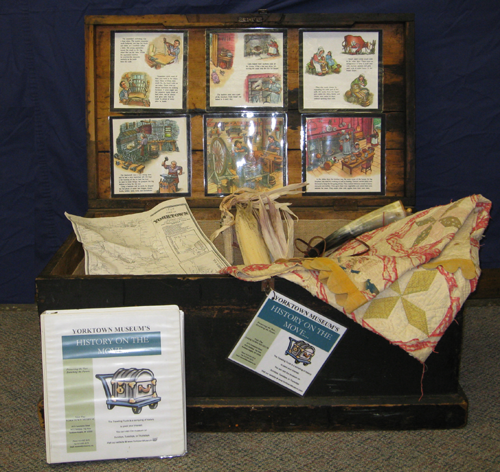 The trunk is filled with items taken from the Town of Yorktown Museum’s archives. They are meant to give a glimpse into the life of our earliest settlers. Over 40 items have been selected for the trunk. They are varied in scope so they can be tailored to several age groups. A list of suggested projects is included for those that need a jump-start to use the trunk. After viewing the contents and a class discussion, it is strongly suggested that students be encouraged to visit the Yorktown Museum to expand their knowledge and bring back ideas for further class discussion. There will be a small fee for the use of the trunk (which will be used to expand this program). The trunk needs to be picked up and returned to the museum. Arrangements for the use of the trunk can be made by calling the museum at (914) 962-2970 Monday through Thursday from 10am to 4pm. This page was last updated on April 28, 2011. © 2013, The Yorktown Museum. All rights reserved, USA and worldwide.